In a 5 quart Dutch oven or heavy sauce pan, melt 4 tablespoons of the butter over medium heat. Once butter is melted, gradually add flour while whisking until it combines evenly with the butter. Continue to whisk until roux turns a caramel color. Add onions, celery, bell pepper, garlic, bay leaves, and thyme cooking until vegetables are soft, about 6-8 minutes. Add chicken stock, tomato paste, salt, red pepper, Old Bay Seasoning, hot sauce, and Worcestershire sauce and bring to a boil. Once it reaches a boil then reduce heat to a simmer and cook uncovered for 30 minutes, stirring occasionally. Add crawfish tails with fat, lemon juice, green onions, and parsley and cook for 15 to 20 minutes, stirring occasionally. Add remaining butter and stir to combine well. Taste and adjust seasoning accordingly. Serve over steamed rice. 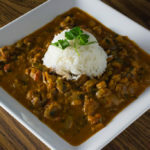 If you are cooking in a heavy pot, you can let it simmer much longer which I find gives it a thicker and richer flavor.